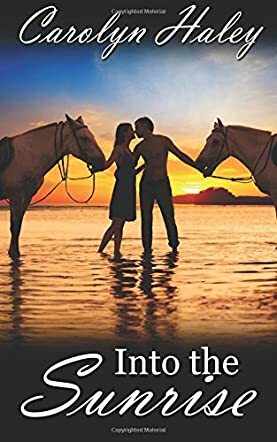 Into the Sunrise by Carolyn Haley is the story of Linnea Eagan (Linny), a woman who is bent on having a career with horses even though her family doesn't agree. After a nasty fall that left her bruised, sore, and with a concussion, Linny must decide what to do with her life as she comes to accept that her relationship is over and that she might not have what it takes to be the champion she always dreamed of being. To make things even more difficult, Michael won't take no for an answer and keeps popping up. Con evokes feelings in Linny that she doesn't want to examine and that she feels she isn't ready for, but no matter how she tries to run, Con keeps making things more difficult and forces Linny to examine the feelings she has for him. Dare she hope they can work through Con's jumbled family ties and have a happily ever after with their horses by their sides? Into the Sunrise by Carolyn Haley is a tale that could step off the pages and become reality. Full of the truth and heartbreak that happen in daily life, Into the Sunrise is a heartwarming story as one woman learns she's stronger than she thinks and starts to fight for what she wants, despite not knowing if it will really work out. Beautiful imagery puts you right there with Linny as she rides one of her three favorite horses. I hope Carolyn Haley continues Linny's tale in a sequel, as I'd love to know how the story really ends!